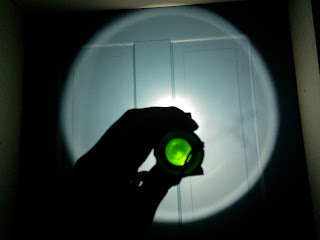 Hope's Cafe: Dorcy LED Flashlight Review and Giveaway!! Do you have camping plans for this fall? I personally love camping-yes, tent camping-and one of the most important tools to bring along is a flashlight. It's really a necessity, whether it's for those late night walks, or a middle-of-the-night bathroom run for one of the kids! We have a couple camping trips planned over the next few months, so I was excited when given the opportunity to review a Dorcy Flashlight! 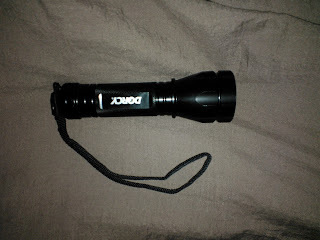 Dorcy is well known as one of the top flashlight companies, and after trying out this new light, I can easily see why. 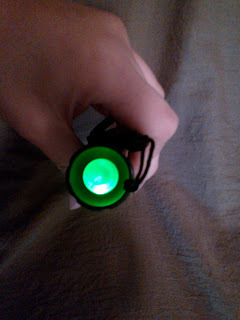 I received the 41-4297 K2 LED Flashlight. This is on the small side, yet is very well made, and has an obvious durable feel to it. The flashlight runs on 3 AAA batteries (included), which gives about 3 hours of run time. It features a carrying strap so you don't drop it while walking. One of the most unique aspects of this light, though, is the built-in battery indicator. When 20% or more of battery power remains, the LED light shines green. When the batteries reach less than 20% power left, the LED turns red. This is wonderful for knowing when to replace the batteries, or at least have another set handy. One of my readers will receive a Dorcy 41-4297 LED Flashlight!! I like the 41-4298 65 Lumens LED - 4D Lantern With LED Spotlight - great for camping! I like the Lumen LED Aluminum flashlight. I like 41-1080 500 Lumen LED Spotlight. I like the wireless motion ceiling light. Lumens LED 4D Lantern with spotlight. I entered Broken frizz free shampoo. I like the LED spotlight beam, would really be hand to have. I entered the Qdoba Mexican Grill Review and Giveaway!! What Can I say: that Beam Light is the Bomb! I like to run overnight relays, so the 41-2097 134 Lumen Headlight Spot Beam would be awesome! I like the 500 Lumin Spotlight. I entered netTALK Duo Wifi. I like the 500 Lumen LED Spotlight. I entered Ruched skirt giveaway. I like the motion sensor stair light. 41-2096 120 Lumen Headlight Broad Beam (among many others!) Thanks - the prize is great too! Wireless ceiling motion light looks cool..!! Thanks for this generous giveaway..! !